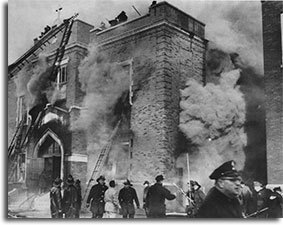 On December 1, 1958 a fire broke out at Our Lady of the Angels Catholic grade school in Chicago’s Humboldt Park neighborhood. 92 children and 3 nuns were killed. The fire started in the basement and spread quickly through the school reaching many combustable substances which accelerated the fire. Jean Gallo, one of my mother’s best friends, had two children who survived this fire. My mother had two close friends in high school who were sisters. Their names were Jean & Teresa Spotts. Teresa married August (Gus) Russo and they had two children, Barbara and Michael. They lived near Berwyn. Jean married Frank Ernest Gallo and they had four or five children; Frank Jr, Sam (Sandy), Anthony, and Theresa. My brother Tom told me the following details about mom’s close friends. “Aunite Jean lived in the Del Principe apartment building at Harrison & Oakley while her husband served in the military. Everyone in the family loved Jean and Theresa’s father. The last time we saw the Gallo family was probably Christmas 1970. We took 2 cars to their house in the south suburbs. Rob & Janie took one car and mom took most of us kids in the other car. Uncle Frank had a split level in a very nice neighborhood. He stayed in the kitchen cooking Italian food the whole time.” Frank Sr passed away in 1973. Tom continued, “Jean and Frank’s oldest son Frank Jr and his brother Sam survived the horrible school fire at Our Lady of the Angels Catholic school. Frank was 9 and in the 4th grade. Sam was 7 and in the 2nd grade. The boy’s father was a paratrooper in the Army Air Force and he had taught Frank Jr and Sam how to jump from trees and roofs, which is why Frank as able to survive the fire”. Frankie was hospitalized overnight with minor burns and for observation of minor injuries. “A kid in my room jumped up out of his seat and hollered, ‘smoke.’ And smoke started coming through the cracks in the door. Our nun was writing on the blackboard. She told us to open the windows and start praying. Then everybody started running toward the windows because they couldn’t breathe. She just stood there, cool as a cucumber.” Frank said that after seeing several boys jump, he pulled himself onto the window sill, sat down and slid off, falling 25 feet to the hard ground below. “I felt like my back was broken. I crawled along a while and then got up. A lot of them couldn’t get up.” Firemen found Frankie sitting on a curb in shock, and had him taken to the hospital. Frank passed away on May 8, 2011. Brother Sam Gallo age 7. Sam escaped without injury from his first floor classroom. Neighbor Alice Tarsa took him into her home until his parents could get him. 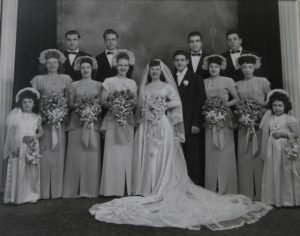 The photo to the left is Auntie Jean and Frank Gallo’s wedding photo. My mother Corinne is second from the left. Jean’s sister Teresa is between Jean and my mother. I have two more photos of the bride and would love to forward these three photos, which are in excellent condition, to Jean or Theresa descendants. Unfortunately we’ve lost touch with the Gallo and Russo families. 2 floors and a basement with 3 classes of 8th graders. Our school, Queen of All Saints, prayed for the children and Sisters who were lost that day. This was one or maybe THE worst disasters that ever happened to Catholic parents and the Order of Sisters that tried to save as many children as possible. RIP. Great Story, I was just thinking about them last month, Barbara Russo is My Godmother. Hello, my name is Michaella. I am sam’s daughter. I would love to see any photos you have of my grandma jean! She passed when I was about 5, so I love seeing her in old pictures or any way I can really. You can reach me by email, if you would like. Thank God that Frank Sr instilled his courage in his sons. Those little boys were saved by jumping from the roof. God was with them.